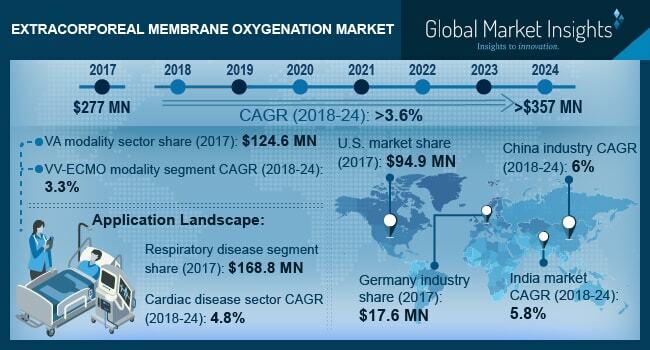 Extracorporeal Membrane Oxygenation Market size is set to exceed USD 357 million by 2024; according to a new research study published by Global Market Insights, Inc.
Increase in cases of cardiopulmonary diseases and respiratory failure in Asia Pacific region will propel the extracorporeal membrane oxygenation market over the forecast timeframe. Currently there are around 4.2 million people with heart failure in China and around 1 million people in Japan. High patient population, developing healthcare infrastructure and high prevalence of cardiopulmonary disorders will lead to industry growth. Rising government initiatives and programs in Europe is expected to augment the extracorporeal membrane oxygenation market over the forthcoming years. The ECMO program that were initiated in several European countries such as Poland in order to improve the standard of treatment conducted, pertaining to instances of respiratory failure and COPD cases. With increasing government initiatives, the demand for ECMO systems is most likely to grow during the projection years. Dearth of skilled professionals, attendants and technicians will be one of the major market growth restraining factors. Extracorporeal membrane oxygenation is a complicated technique associated with several risk factors and need skilled professionals to carry out the procedure. Aforementioned factors will be responsible for declining industry growth. Arteriovenous extracorporeal membrane oxygenation (ECMO) market is estimated to show considerable growth in the forecast timeframe at a robust CAGR of 2.3%. It has the capabilities to provide the life support while minimizing the risks related to oxygen toxicity and barotrauma. with increasing applications of arteriovenous ECMO, the demand should only increase in near future, resulting in market growth. Extracorporeal cardiopulmonary resuscitation (ECPR) market will witness substantial growth at a CAGR of 4.2% from 2018 to 2024. ECPR is one of the most rapidly growing techniques in patients with cardiac arrest and is becoming more wide spread due to its varied application in treatment of cardiopulmonary disorder. Increasing use of ECPR to provide circulatory to the patient during cardiac arrest will assist industry expansion. Pediatric ECMO market segment is slated to experience robust growth at a CAGR 3.2% over the projection years. The use of extracorporeal membrane oxygenation in pediatric patient population has increased significantly in the last few years. Increasing use of ECMO in pediatric patients in order to provide long term heart and breathing support will augment the industry growth in coming few years. Germany dominated the Europe extracorporeal membrane oxygenation market with a total market value of USD 17.6 million in 2017. High number of ECMO procedures in the country is one of the prominent demand driving factor; in fact, number of ECMO procedures rose to around 6,000 in the year 2014 from previous year, growing almost three times in the last five years. In high income countries such as Germany, rapid rise in use of ECMO in the last few years to provide both cardiac and respiratory support will foster high growth opportunities. India extracorporeal membrane oxygenation market is anticipated to grow at a CAGR of 5.8% during the forecast time period. Increase in number of people suffering from Acute Respiratory Distress Syndrome (ARDS), a progressive form acute respiratory failure, characterized by severe non-hydrostatic pulmonary edema and hypoxemia will drive the demand for ECMO procedures. Also, developing healthcare infrastructure in the country along with rise in awareness among the people regarding cardiopulmonary disorder will further escalate the business growth. Prominent industry players include Getinge, Medtronic, Terumo, Abbott, LivaNova, and Alung Technologies. The industry players are focusing on strategies such as improving their production number and quality, merger and acquisition, new product development and geographical expansion for improving their market place.